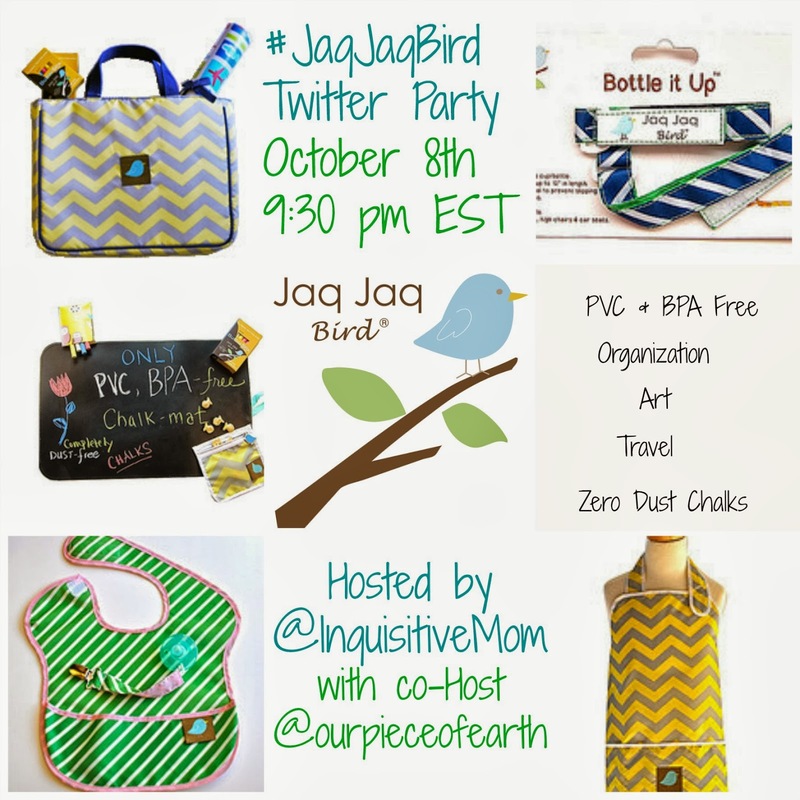 I am so excited to introduce you to the world of Jaq Jaq Bird and invite you to a Twitter Party on Tuesday, October 8th, at 9:30 pm EST hosted by The Inquisitive Mom and Our Piece of Earth! We're excited to be joined by special guests @wifemummynurse, @Thankful4Thorns, @TheMedianMommy, @mamacollective, @sunshinepraises, and @SAHMofDQ. If you use cloth diapers, you're probably familiar with the Jaq Jaq Bird Perfect Pouch by now. This fabulous wet bag is a generous size and made of a proprietary fabric that provides a leak, sweat, and water proof environment for diapers, swimsuits, wet clothes, etc. Jaq Jaq Bird Perfect Pouches are also the preferred wet bag of the folks at Spray Pal. In fact, MommyCon attendees can meet these two at their booth this coming Sunday. The same awesome material that makes the wet bag so useful is also found in a variety of fun and practical accessories for your family. Jaq Jaq Bird offers adorable, adjustable bibs , mini pouches for lunches, adorable kid's aprons, activity totes, pacifier catchers, and more. Each of these products is made with your child and mind, can be adjusted to fit comfortably, contains messes, and can be easily cleaned. Plus, both mom and kids will go crazy for a mess free chalk experience using Jaq Jaq Bird's butter stix and chalk mats. New to Twitter Parties? No worries. Just follow the easy steps below to join us and have a great time! 1. Complete your RSVP using the easy Giveaway Tools form below. Only the first entry is required, but complete more entries for additional chances to win a prize. 2. Don't have a twitter account? Creating one is easy at www.twitter.com. 3. Before the party begins, create an account at www.tweetdeck.com. This will be your party venue and the place to chat with hosts and other party-goers. 4. A few minutes before the party, go in and set up your Tweetdeck space for the ultimate party experience. Here's a great tutorial from Toronto Mom to get you started. This is a screen shot from the last twitter party I hosted to provide a visual of how I set up my screen. 5. Before the party, be sure to make your settings "public" in twitter if you have a private account (public is the default setting). If I can't see your tweets, they won't count. Add your twitter handle to Column 1. 6. Add #JaqJaqBird to Column 2 as your party hashtag. 7. Add @InquisitiveMom, @JaqJaqBird, and @OurPiece of Earth to Column 3 as your party hosts. 8. Add @wifemummynurse, @Thankful4Thorns, @TheMedianMommy, @mamacollective, @sunshinepraises, and @SAHMofDQ to Column #4 as yourSpecial Guests. 9. Create a tweet and add #JaqJaqBird to the end at least once between 9:30 EST and 10:30 EST. This hashtag will allow the other participants to see your tweets and will add them to column 2. Tip: Write #JaqJaqBird and copy it, then you can just hit "Ctrl V" to add it quickly to all tweets. 10. Relax, join in the conversation, and have fun! Learn about a fantastic company, cross your fingers for a win, and make some friends along the way! I LOVE the chalk placemats! I think these would make a fabulous Christmas present! The snack pouch looks like it is the perfect size!